Forget about computers, tablets or smartphones; today, battery-operated sensors are the main engine driving the Internet of Things (IoT). From environmental and energy to parking and occupancy; sensors are used across all industries to gather huge amounts of critical data. Traditional communication solutions cannot provide the viable connectivity needed for industrial and commercial sensor networks. Cellular networks are expensive, power hungry and experience significant coverage gaps when it comes to underground and remote locations. Mesh networks cannot scale beyond medium-range applications because of their excessively complex network setup and management. Low-Power Wide Area Network (LPWAN) technology, provides the low cost, low power and wide-area coverage needed for robust IoT sensor networks. Long Range: The operating range of LPWAN technology varies from a few kilometers in urban areas to over 10 km in rural settings. It can also enable effective data communication in previously infeasible indoor and underground locations. Low Power: Optimized for power consumption, LPWAN transceivers can run on small, inexpensive batteries for up to 20 years; reducing maintenance costs. Low Cost: LPWAN's simplified, lightweight protocols reduce complexity in hardware design and lower device costs. Its long range combined with a star topology reduce expensive infrastructure requirements, and the use of license-free or already owned licensed bands, reduce network costs. Every IoT application has specific requirements. 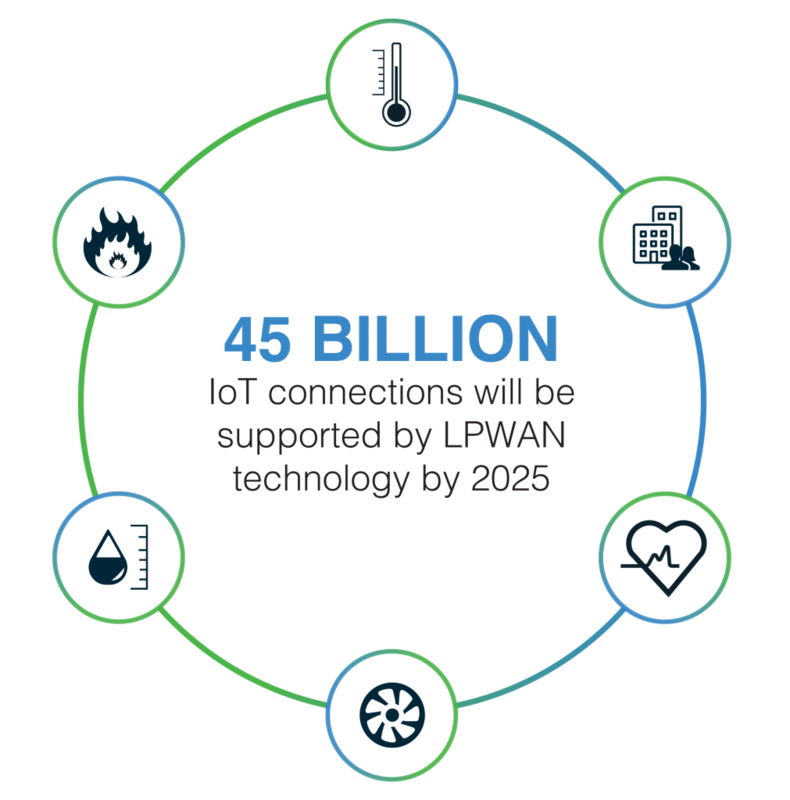 To ensure you select the right LPWAN technology for your next IoT project, take the following factors into consideration. QUALITY OF SERVICE: High data reception rate is key to ensuring excellent QoS and industry-grade reliability. To achieve this, interference immunity is a necessity for LPWAN technologies operating in the license-free spectrum. SCALABILITY: A large network capacity is essential for future network expansion and an exponential number of end devices. One major indicator is the number of daily messages or devices that can be handled by a single base station. BATTERY LIFE: Low-power consumption can significantly reduce Total-Cost-of-Ownership and help achieve sustainable business goals in remote sensor networks. MOBILITY: Data transmission from end-nodes moving at high speeds enables key IoT applications such as worker safety and fleet telematics. SECURITY: Multi-layer encryption with strong identification and authentication systems, ensure secure data transmission and integrity. PUBLIC VS. PRIVATE NETWORK: Private LPWA networks offer more flexibility in network design and coverage, whereas public LPWA networks often raise concerns around data privacy. PROPRIETARY VS. STANDARD: An industry standard solution avoids vendor lock-in problems while ensuring credibility and long-term interoperability with other components in the IIoT ecosystem. Cellular LPWAN (3GPP standards) solutions offer high data rates and bandwidth alongside guaranteed QoS and reliability. However, these benefits often come with higher power consumption and increased costs due to more complex protocols. Also, certain cellular LPWAN technologies, like Narrowband-IoT, are intended for stationary end devices only. Spread Spectrum solutions transmit a narrow signal over a wider frequency band to improve resilience against interference from other systems. However, this approach uses the shared spectrum inefficiently and often experiences major self-interference challenges which can limit overall network capacity and scalability. While simplifying the transceiver design, traditional UNB technology results in extremely low data rates. This lengthens the transmission time (“on-air” time) of a message which increases power consumption and interference vulnerability. Combined with duty cycle regulations, low data rates also limit the number of messages that can be sent daily and hourly. In addition, UNB networks do not support communication from high-speed end-nodes. 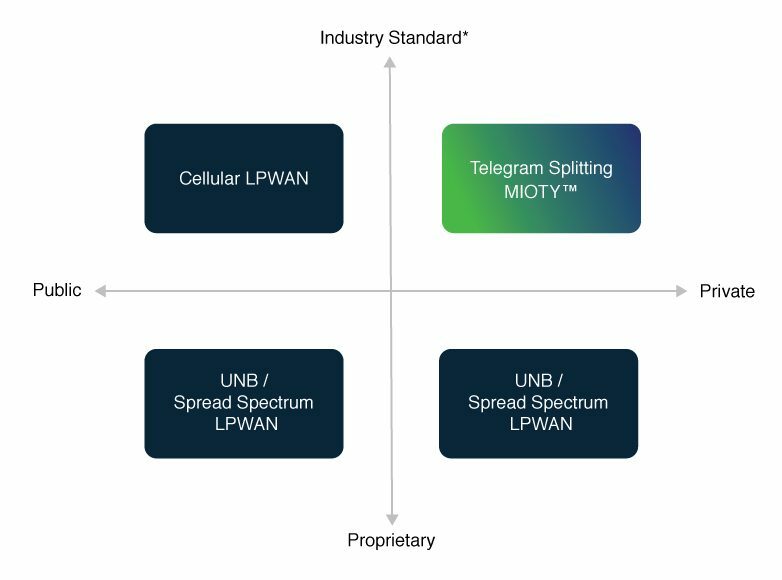 Telegram Splitting is the only standardized LPWAN technology in the license-free spectrum. UNB signals are split into smaller sub-packets and distributed over different times and frequencies to improve interference immunity, scalability and power efficiency. Telegram Splitting also supports communication from high-speed devices with up to 120 km/h velocity. Learn more.